Main access through the wheelhouse with saloon quarter. Access to the boatman's cabin, in aft, an independant 20m2 flat to itself: double bed (130x180), shower and heads, galley and saloon table, central heating. Forward to the wheelhouse is the 135m2 live aboard area. A long corridor with storage on the starboard brings to the several cabins, on the port side (a double cabin with single bed but could accommodate a double berth).Following is a shower heads room and utility room with washing machine/dryer. Then follows a spare room currently used as an office. Forward is the main saloon with open plan galley for a total of 60m2. An old Dutch stove in the corner mainly used as decorative, central heating everywhere. Follows the master cabin with ensuite bath, shower room. Also a direct access to the foredeck and entertaining area by a wooden staircase. Filtered water provided and stocked into 2 tanks for a total capacity of 4000 litres. Diesel burner boiler for main hot water and central heating through radiators. Live aboard Luxmotor for sale in France. Boatshed Paris is happy to offer this Luxmotor for sale in the North of Paris and located in a quiet and residential area. A well transformed and quality finished barge, with all the comfort required for live aboard for a family and their guests. 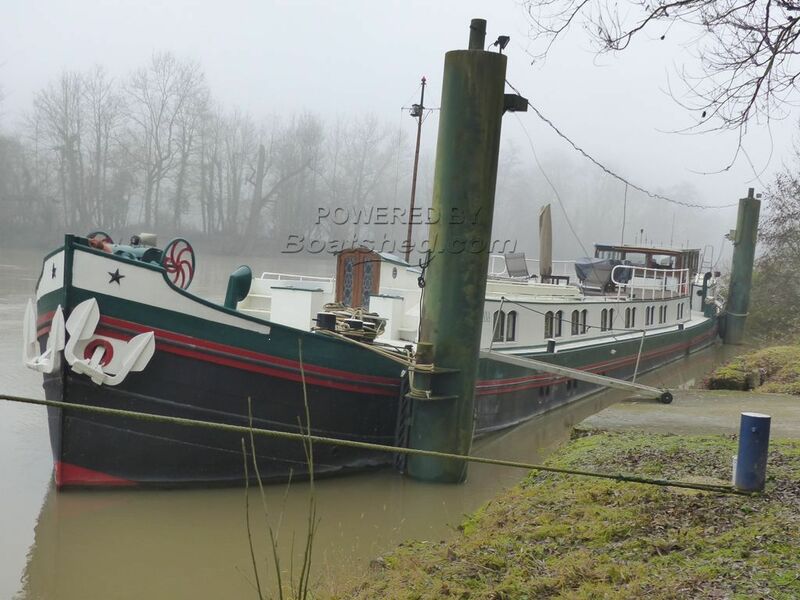 Only 1 Hour away form Paris, and 30min from Roissy airport, it will be ideal as a residential barge but also could be use as a charter barge project. Bright interior with all these clear wood panels, lots of charm, comfort and cosy interior which could make a great family home. Please note the furnitures are not included in the sale. A great autonomy boat (great tank capacity, water filter system, self sufficient in electricity too with batteries charges by solar panels, inverters and shore power) a 800 Litres holding tank. If you want more information about this boat and organise a visit, please contact, Pascal GAETAN, your local broker at Boatshed Paris. This Luxemotor Dutch Barge Live Aboard Barge has been personally photographed and viewed by Pascal GAETAN of Boatshed Paris. Click here for contact details.